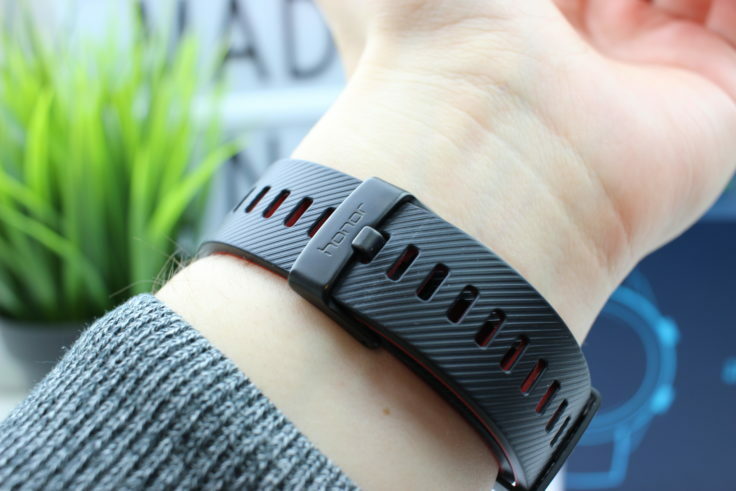 Gadgets like the Honor Band 4 of the manufacturer show that they are no longer beginners in the field of wearables. 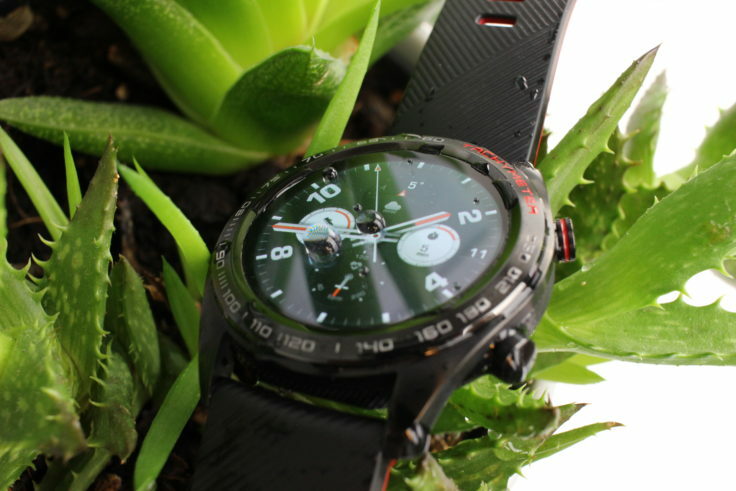 The expertise is also noticeable with the new Smartwatch, because optically one gets a classy watch offered here. At first glance, you could easily mistake it for a “normal” men’s wristwatch. And that’s exactly what I personally find very appealing. As a wearer of normal watches for many years, I missed the look & feel of a classic watch more than I thought. The watch feeling is further strengthened by the fact that the Magic with dimensions of 42.8 × 42.8 × 9.8 mm is quite close to a classic 42 mm chronograph. Unfortunately, such a thin case can only be achieved with a smaller battery, but more about that later. The ATM5 standard waterproof enclosure is made of stainless steel (316 L) “top” and plastic “bottom”, which also explains the low weight of only 51 g. The ATM5 standard is used to protect the enclosure from water. On the right there are two “pushers” with a good pressure points. The upper one serves as a back/home button and brings you to the app list, while the lower one sends you directly to the sports modes. On the bezel of our black and the blue version there is a tachymeter which can be used for speed measurement. The silver version has a normal bezel with minutes. The bracelet of our Sport-Edition is completely made of silicone. The blue and brown version, however, has a strap that combines genuine leather and silicone and should therefore not be worn when showering or swimming. The silicone band is a bit thicker than the Honor Band 4, but of the same good quality and a bit corrugated on the outside. Inside it is smooth and red, which fits to the “Tachymeter” lettering and the red accent on the upper pusher. Fortunately, it’s also a standard 22mm strap, which can easily be exchanged for others. A darker metal bracelet certainly looks good here, too. The centre of attention at a Smartwatch is of course the colour display. 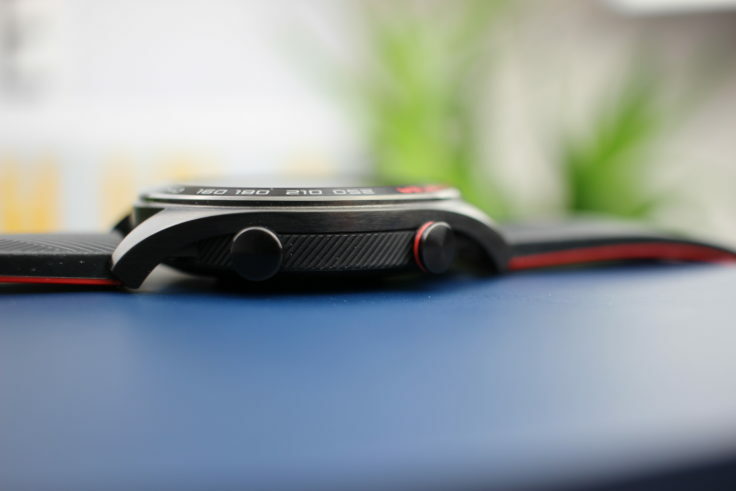 With a diameter of 1.2 inches, this is slightly smaller than, for example, the Ticwatch E, with 1.4 inches. This is an AMOLED display, a popular choice for Smartwatches. However, the resolution of 390 x 390 pixels is quite respectable and brings the screen to a sharp pixel density of 326 PPI. For comparison: the Amazfit Bip reaches 194 PPI. Thanks to OLED technology, the screen offers very good contrast and is easy to read even in strong light. There are five brightness levels and one auto mode. This works very well thanks to the built-in light sensor and saves you a display that is much too bright in the morning and evening. The touch screen reacts very well and was surprisingly easy to use even in the shower and while swimming. A total of nine dials are available, others cannot be installed. Unfortunately there is very little room for strong hardware in such a small case. Therefore Honor uses the ARM Cortex-M4 as processor, 16 MB RAM and 128 Megabyte internal memory! Considering the price and how much memory you get from the competition, this is a really disappointing value. 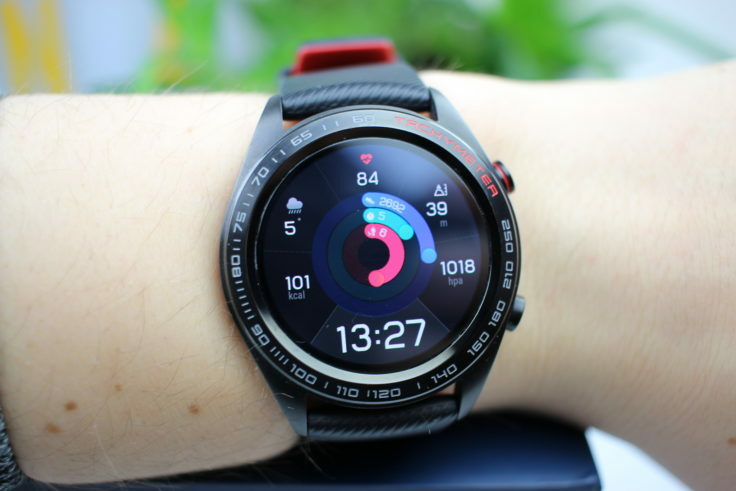 That’s why I wouldn’t call the Honor Watch Magic a Smartwatch, but a kind of “Fitnesstracker Pro”. Saving music files on the clock or downloading additional apps is not possible with so little memory! Due to the hardware, the Magic does not run Google’s WearOS, but Honors/Huaweis’s own LightOS. But this is perfectly optimized, so that you can fly through the menus and apps. It’s even more fun when you know that WearOS smartwatches sometimes falter quite a bit. Apps are all pre-installed and cannot be removed or added. 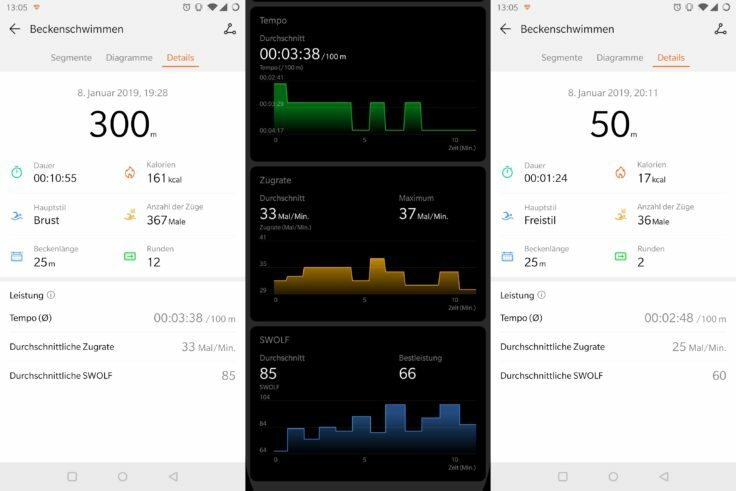 The apps include: Workouts, recordings, heart rate, activity, sleep, stress (not working yet), breathing exercises, barometer, compass, weather, news, ticket (China only), Alipay, stopwatch, timer, alarm, flashlight, phone search and settings. By the way, the clock is in Chinese for now, but will get two updates as soon as you connect it to the Huawei Health App (Android/iOS). Then it is also available in different languages. The battery capacity on paper is quite low. With 178 mAh the pure capacity is not even half as big as the Amazfit Verge and even the Bip offers more. 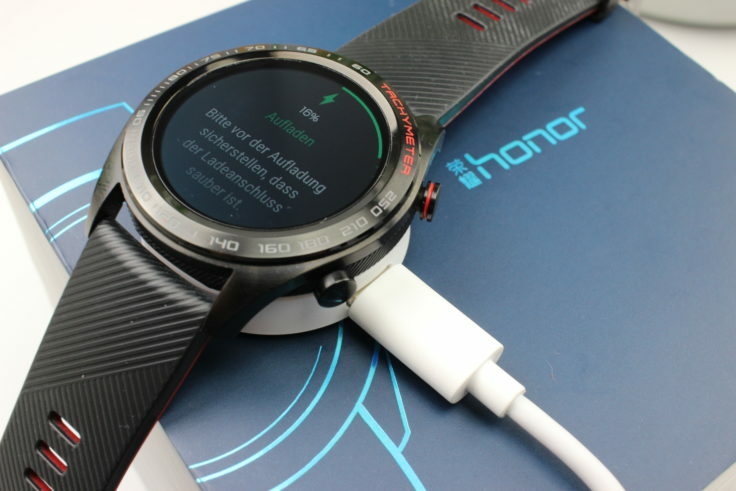 Honor promises however nevertheless a battery running time of up to 7 days with switched on pulse measurement. Without these even two weeks should be in it. Experience shows that the manufacturer’s specifications are always a bit high in this respect. So how does Honor do here? Surprisingly good! With heart rate measurement and a run of 10 kilometers, which Honor Watch Magic tracked via GPS, I had a solid 6 days running time. Without the pulse measurement, which takes place every two minutes, there are probably twelve days in it. The watch is then loaded via two contacts on the back. The included charger is magnetic, so that the watch is very tight when charging. The charging station itself is supplied with power via USB-C. The cable is included, a USB power supply is unfortunately not. 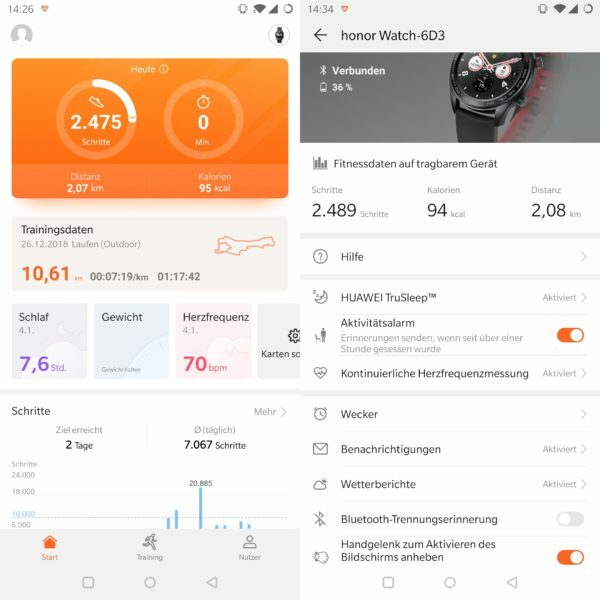 Honor integrates the following sports modes, which can be started directly from the clock: Running (Out-/Indoor), Walking (Outdoor), Hiking, Cycling (Out-/Indoor), Swimming (In-/Outdoor) and Free Training. 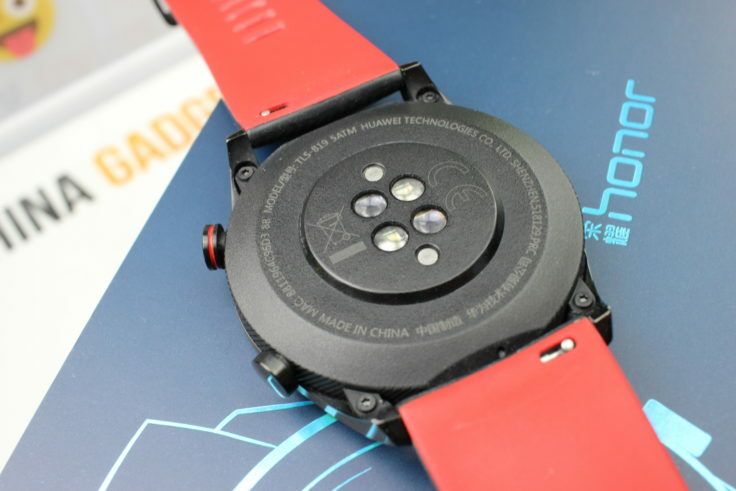 In order to be able to collect the appropriate data for outdoor sports, Honor installs a GPS, GLONASS & GALILEO module and an optical heart rate monitor on the underside of the watch case. During active sports tracking, the pulse is measured continuously and not only every 2 minutes. 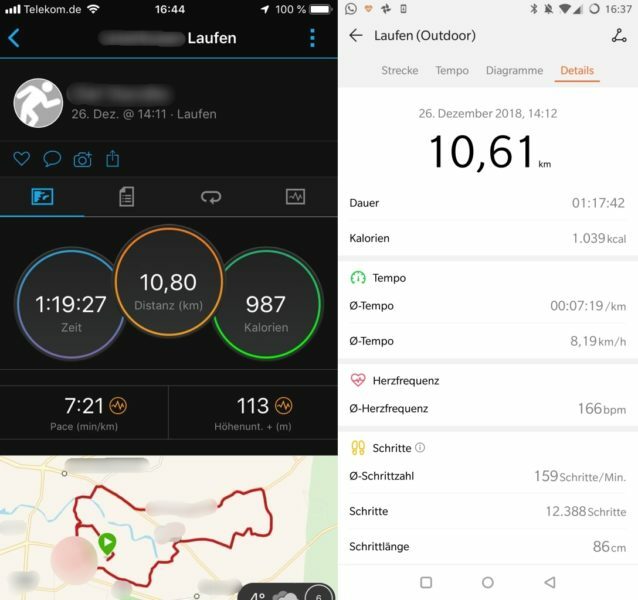 In the comparison test with a Garmin GPS watch, I came to a very similar result and the small deviation could also be due to differently fast pause and restart. Also while swimming I had the Watch Magic on and pulled a few lanes. On the watch you can set the length of the pool and a goal (laps, time, calories). As soon as you start the swim tracking, the screen will be locked to avoid wrong entries. You can pause and then end the tracking simply by pressing the upper button. To unlock the screen, press the lower button a little longer. When the tracking is finished, you can already see all data on the clock and synchronize it later with the app. The clock automatically recognizes in which style you swam and also calculates the SWOLF value. By the way, the watch survived the swim completely undamaged, although an ATM 5 protection does not guarantee this (actually only showers, bathing, rain, etc.). But the watch is not only useful for sports. Thanks to the integrated barometer and magnetometer, the Magic also serves as an air pressure/altimeter and compass when hiking. Step and sleep tracking are of course also available. 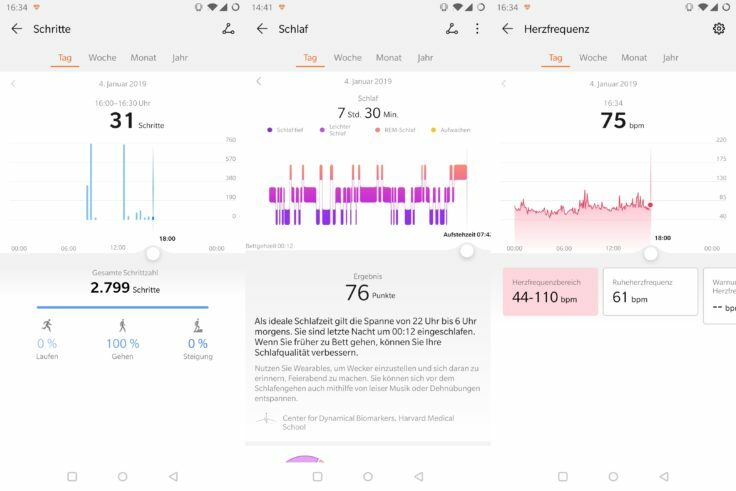 Thanks to the cooperation with Harvard Medical School, sleep tracking in particular should be very accurate and shows REM phases (Rapid Eye Movement) in addition to light and deep sleep. And of course there’s an intelligent alarm clock that can wake you up up up to 30 minutes earlier if you’re in a light sleep phase. The built-in NFC module can be used in China for bus tickets, unfortunately it is still useless with us. However, Huawei Pay has already been announced for Europe and should start in 2019. Since the payment procedure works like Google Pay over NFC, this could bring an added value to the watch. 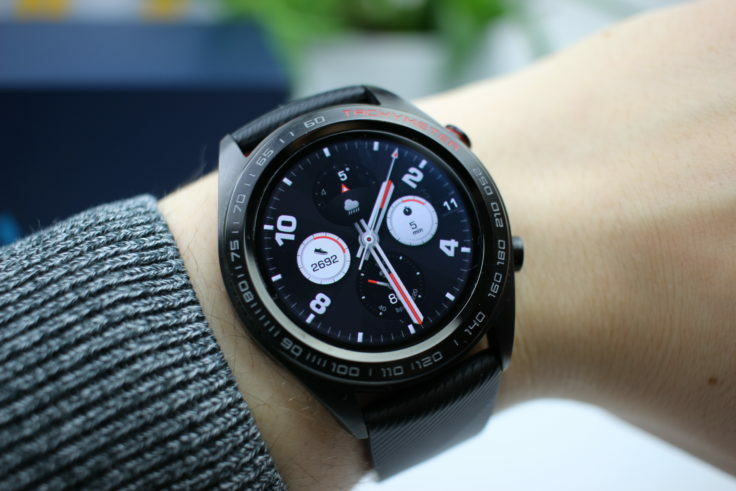 However, it is still unclear whether a Huawei/Honor smartphone is inevitably needed for Huawei Pay or “only” one watch of the brands is enough. Should you buy the Honor Watch Magic? 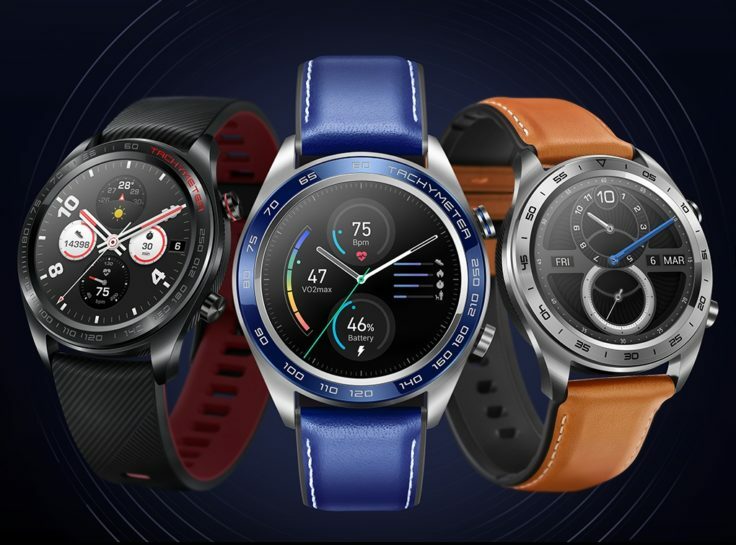 In my opinion, the Honor Watch Magic should not be called Smartwatch, because it lacks local memory and support for third-party apps. If you take a look at the competition, you will notice that the Amazfit Bip offers a similarly large range of features but costs only ~$50. Nevertheless the Honor Watch Magic replaced the Mi Band 3 (after more than 7 months). The personally very appealing design, the great display, the surprisingly good GPS tracking and the solid battery life convinced me. If you don’t like the design so much and can do without the good display, you can take the Amazfit Bip or even the Amazfit Pace with a clear conscience as a much cheaper alternative with a better battery life. But if you want to wear a watch on your wrist again, you should choose Honor Watch Magic. 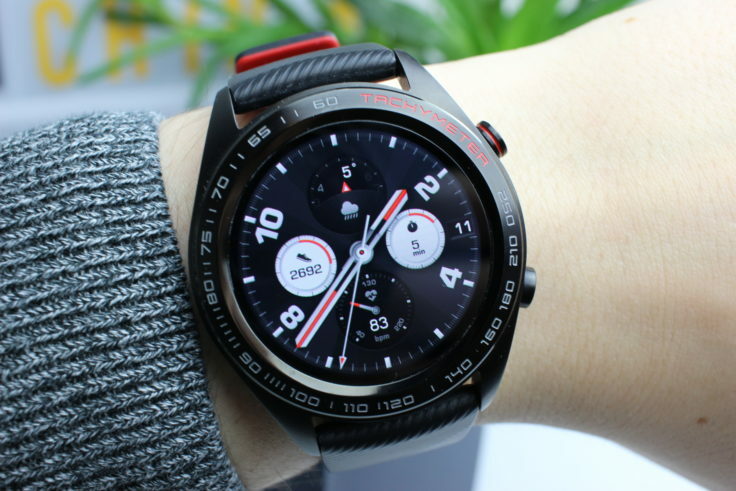 What do you think of the Honor Watch Magic? Which tracker do you currently use and is the Watch Magic a possible upgrade?